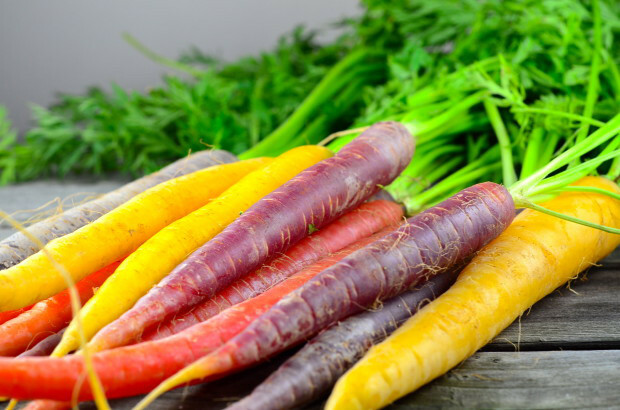 Share the post "The History Of Carrots And Carrot Colors"
We’re all used to see and eat an ordinary orange carrot, but did you know that there is an entire rainbow of carrot colors, and the orange root we all know and love is the new carrot color? Before then, carrots were purple, red, white, yellow, or black. Root pigmentation depends on the relative proportion of different carotenoids for the white, yellow, orange and red types but only internally for the purple and black ones. The orange carrot, now so familiar, was once a novelty. In fact, this young upstart was first cultivated a little more than four hundred years ago. Until then, the purple variety was supreme. Although we consider the carrot immutable, it has been continually reinvented though the ages. The cultivated carrot is one of the most important root vegetables grown in temperate regions of the world. Historical data indicate that root colour has been differentially selected over time and according to geographical areas, but the time frame and geographic region(s) of the first cultivation of carrots are unclear. The research team traced carrot evolution as far back as the dinosaurs. Sometime between the Cretaceous and Paleogene periods – roughly around the time dinosaurs went extinct – carrots, along with other plants of the era, picked up genetic advantages that allowed them to thrive in differing environmental conditions. The earliest vegetable definitely known to be a carrot dates from the 10th century in Persia and Asia Minor and would have been quite unlike the orange rooted carrot of today. 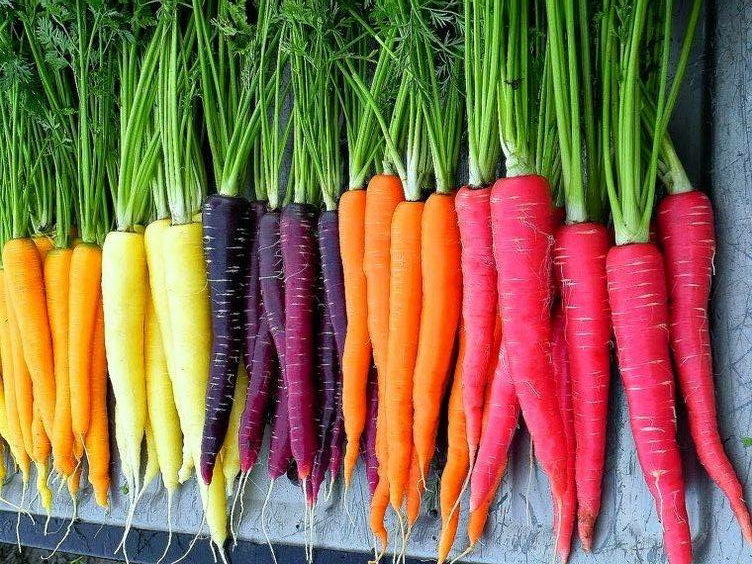 It is considered that сarrots were originally purple or white with a thin root, then a mutant occurred which removed the purple pigmentation resulting in a new race of yellow carrots, from which orange carrots were subsequently developed. Almost five thousand years ago, carrots were firstly cultivated in the Iranian Plateau and then in Persian Empire. Western and Arabic literatures along with the studies by the US Department of Agriculture (USDA) reveal that carrots were originated in Afghanistan, Pakistan, and Iran. The purple carrot existed in Central Asia for several centuries before it was brought west by the Arabs in about the 10th century. It spread slowly to the area of the Mediterranean and was probably white, yellow or purple. However, it is not known whether or not the Egyptians or Greeks cultivated a very edible plant or if they only grew wild carrots for their seeds. Mostly they were used medicinally. Nowadays you can find and buy Natural Carrot Seed Oil , which is full of naturally-occurring beta carotene, provitamin A, vitamin E, carotenoids, tocopheryl & more. Natural Carrot Seed Oil is ideal for mature or dry skin types, as well as damaged and brittle hair. Ideal as a natural anti-aging beauty serum. Carrots likewise found a place as a medicinal plant in the gardens of ancient Rome, where it was used as an aphrodisiac and in some cases as part of a concoction to prevent poisoning. Red and yellow carrots started to appear in Europe in the 13th century and it is now known, from modern genetic research, that orange carrots were developed from those yellow varieties. It was probably the Dutch who developed the orange carrot in the 16th century. Holland was the leading nation when it came to agricultural science at this time. But there is no documentary evidence that the Dutch “invented” orange carrots to honour their Royal Family, the House of orange. There is a tale, that the orange carrot was bred in the Netherlands in the 16th century to honour William of Orange. Though the development and stabilisation of the orange carrot root does appear to date from around that period in the Netherlands, it is unlikely that honouring William of Orange had anything to do with it. So, it is true that the Dutch developed and stabilised the orange carrot, but more likely subsequently the Dutch people adopted the colour orange and orange carrots as their national vegetable. To this day, many in the Netherlands genuinely like to believe that orange carrots were originally grown specifically as a tribute to the House of Orange. No matter how many times it is repeated and passed on through the generations it still remains pure folklore. But, it is also quite possible that orange carrots did exist before the 16th century, but there was no word to describe that colour, so carrots were often described as red or yellow and other variations of those colours. e.g. yellow-red. There are compelling arguments for a much earlier, near eastern origin – the Byzantine illustration in the Dioscorides codex, drawn in 512 ad shows quite clearly carrot plants with a thick, orange coloured root, indicating that carotene cultivars already existed at that time. 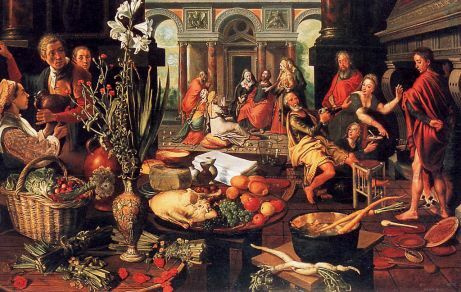 One of the earliest depictions of an orange carrot, in works of art – Pieter Aertsen Christ in the Home of Mary and Martha 1553 (oil on panel, location Museum Boijmans Van Beuningen, Rotterdam). Did the Dutch “invent” orange carrots to honour the House of Orange? Why are carrots orange? – Carrots are orange because they absorb certain wavelengths of light mcarrot crownore efficiently than others. Beta-carotene is the main pigment. Carotenoids are one of the most important groups of natural pigments. They cause the yellow/orange colours of many fruit and vegetables. Though beta-carotene is most abundant in carrots it is also found in pumpkins, apricots and nectarines. Dark green vegetables such as spinach and broccoli are another good source, but the orange colour is masked by the green colour of chlorophyll. Carrots are readily available in five main colors in the stores these days: orange, red, purple, white, and yellow. Each color has a different health benefit. Orange carrots contain beta carotene, with some alpha-carotene, both of which are orange pigments. The body converts the high content beta carotene into Vitamin A, essential to the immune system for general well-being and healthy eyes. These carrots originate from Europe and the Middle East. Yellow carrots contain xanthophylls, pigments similar to orange beta carotene, which help develop healthy eyes and aid in the fight against macular degeneration. They may also be useful in preventing tumors associated with lung and other cancers. These came from the Middle East. Red carrots contain lycopene (another form of carotene), a pigment also found in tomatoes and watermelon; lycopene helps in the fight against heart disease and some cancers, including prostate cancer. These were originally from India and China. Purple carrots (usually orange inside) get their pigment from an entirely different class, the anthocyanins. These pigments act as very powerful antioxidants, grabbing and holding onto harmful free radicals in the body. Anthocyanins also help prevent heart disease by slowing blood clotting. These originate from Turkey, and the Middle and Far East. White carrots , by their very nature, lack pigment, but may contain other health-promoting substances called phytochemicals. One would say these are the least healthy of carrots. They originate from Afghanistan, Iran, and Pakistan.